Perhaps three stars doesn’t quite do justice to the tremendous achievement of turning this complex story – the heinous real-life actions of super-lobbyist Jack Abramoff – into a sharp, scathing and satirical feature film. The story of Jack Abramoff (Kevin Spacey), the wily Republican lobbyist who, for however short a time, exploited just about every loophole in American capitalism to establish a wealthy empire, was made into a head-spinning but entertaining comprehensive documentary by Alex Gibney just a year prior to this film. Hell, it even had the same name – Casino Jack – with the subtitle, The United States of Money. The dramatized version could have gone a number of different ways, with numerous stories to be told about the rise and fall of Abramoff, and director Hickenlooper and his filmmaking team confidently find the absolute right tone through which to tell this story. Hickenlooper begins with Abramoff already established as a super-lobbyist. He’s exploited the low minimum wage laws in the US-controlled Marianas Islands to amass a small fortune, the fruits of which he uses to cozy up to a number of influential congressmen, including the now infamous Tom De Lay. Next up for Abramoff is the cash cow that is Indian casinos. Because of Native American land sovereignty, the casinos can operate with little interference or regulation from the government. Writer Norman Snider and director Hickenlooper do a remarkable job transforming this story into a very carefully calculated black comedy, the tone of which generates laughs, and most importantly, gets to the heart of how and why Abramoff was able to defraud so much money from the American tax payers. It’s the basis of American capitalism, a system which, for good and bad, encourages people like Abramoff to walk the fine moral and ethical line in order to squeeze as much money out of the system as possible. Hickenlooper keeps a brisk pace jet-setting around the world to follow his characters. Miraculously, most of this film was shot in Toronto, creatively using Canadian locations to double for numerous international locations, including Miami, Scotland, Washington and more, all contributing the full-scale scope of their influence. But it’s the performance of Kevin Spacey, who was deservedly nominated for a Golden Globe this year, that makes this film a success. It's a terrific show-offy performance, his best in a decade. 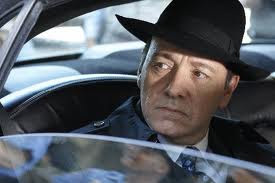 Spacey moves between an affable wannabe with delusions of being a Hollywood movie character like the Godfather and the ruthless businessman/entrepreneur only a country like the United States could create. Barry Pepper plays Abramoff’s loose-cannon right-hand man, Mike Scanlan, who makes a wonderful supporting character. Both men are portrayed as naive frat boys intoxicated by money and power and supremely cocky and brazen, amplifying their performances to the extreme for the sake of comedy and to complement the astonishing level of immaturity that brought them down. Sadly, George Hickenlooper died at a young age last year, before the film even received its theatrical release. It's a shame, but his legacy is strong. Other than Casino Jack, he will also always be remembered for his great Apocalypse Now documentary Hearts of Darknness. Casino Jack is available on Blu-ray and DVD from E1 Entertainment in Canada.